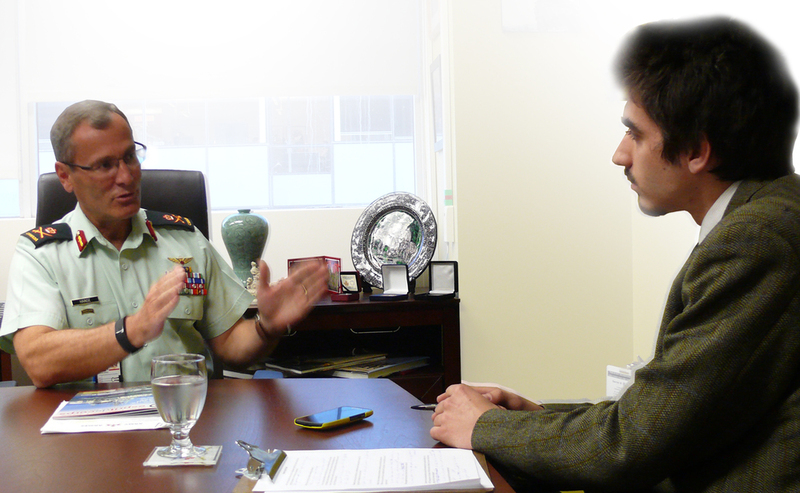 It was not an April Fools prank when Esprit de Corps journalist Jack Lytle sat down for a one-on-one interview with Lieutenant-General Marquis Hainse, Commander of the Canadian Army, on April 1. What follows is an edited version of that discussion, which covered the push for changes in training which Hainse has championed, as well as some of the factors that effect making adjustments to long-standing military practices. EdeC: General, after serving almost three years as commander of the Canadian Army, what has been the most surprising element of your job? Hainse: There are a lot of elements that have been surprising, but I’ll pick two. First, there were some basic issues, which I mistakenly took for granted for being more under control than they actually were. The second is that sequences of events move more slowly than I thought they would. Why would I say things are moving slowly? Well, trying to change a portion of military culture or a training regimen takes time. We did things in the post-Afghanistan era that took more time than I expected. Looking at it from a training standpoint, we have been used to a certain way of doing training; this is the way we have done it for years in the Afghanistan era. Now, we have to adapt the way we train, while still implementing all the good lessons that we have learned so far. I would say that after three years, training regimens have been brought up to speed, but it took longer than I expected. When I say I have learned to not take anything for granted, I think the best example is Operation HONOUR. I honestly thought the Army and the Canadian Armed Forces were better at preventing sexual misconduct than we are. That was until we conducted a study. We took for granted that certain training was happening. Sexual harassment and awareness training was something we were talking about, but it was just not being implemented to the extent that it should have been. We took our eyes off the ball. You need to keep nurturing what you believe in. Whatever that subject might be. We are not there yet, but we are making progress. EdeC: You said certain initiatives had moved a little slower than expected. What factors have slowed things down? Hainse: Well, I did expect that we would go back to a foundational training stance a little sooner. But our movements are generational. When people are used to doing something in a certain way, you need to shake the entire system to make them do it differently. I did not realize to what extent that I had shook the system. You have to be bold to change. It’s something I have taken for granted, that we would now be able to focus on foundational training. Changes were not being adopted as quickly as I had hoped because it takes awhile to get an army into a new mindset, depending on the level of experience of those involved. Having said this, when you have an operational imperative, it always makes it easier. If we were asked to deploy an operation on par with the scale of our Bosnia or Afghanistan missions, I think the transition would happen quickly. Over the past three years, our operational tempo has been a little slower. Not necessarily slower paced in terms of activities. A faster operational tempo is what we needed, to be frank. I think now we are well poised to increase the tempo should the government decide to do so. EdeC: What have been the most unrelenting challenges during your tenure? Hainse: Again, I would say there are two. One deals with recruiting, particularly in regards to reserve recruiting and retention of those troops. The other one is mental health. Recruiting is something we need work on, even though we are sufficient in regards to the Regular Force. When we look at the Reserves, there are changes that need to be made. There is a systemic problem being addressed now that we have needed to change for some time. But then again we could have reacted to this problem faster. Since the Reserve Force does constitute 50 per cent of the Army, it is important to recognize the significance of the depth they provide to us. Both in Bosnia and Afghanistan the Reserves were active and involved. I would like to keep that momentum as well as build on it. In order to have a Reserve Force that is ready to provide depth, we need to recruit people. We not only have to recruit, but find a way to retain them also. We have to incentivize staying involved after they are done with their training or studies. Why should they stay with us? We need to have a narrative to address this. You know, give them good training so they are well poised to being deployed on operations. All while they carry on with their life on the civilian side, provided that their employers are supporting. Thankfully, there are a lot more employers that are now supportive of the Reserve program. Mental health is something that keeps coming back. We do need to address this. We are moving forward a lot, in regard to mental health, but it always comes back and shows its ugly face. In my years of command, I never thought that I would face such an emotionally challenging issue as suicide and its prevention. I realize that it is not always linked to operations. It is also linked to a societal dilemma; lots of people will arrive at a recruitment centre with emotional stress. We have to find ways to improve the resiliency and the performance of their day-to-day life — not just when they go on operations. EdeC: Understandably, the nature of combat would take a toll on anyone’s mental health. Do you think that there needs to be more resources available for soldiers? Hainse: You can always procure more resources, but where does it end? I think as a first step, let’s make sure the resources we have are well used. We have created something in the Army called CAIPS (Canadian Army Integrated Performance Strategy). What is it? Its aim is employing the resources that are already available. Not just our Canadian Forces resources (which there are a lot), but also the promotion of other resources. CAIPS promotes them in a way where it will be easy for young leaders to access and guide their subordinates to the resources that are applicable to them. CAIPS aims at improving readiness, resilience, and it will end up improving overall performance. Not just before a soldier goes on operation, but rather from the day they join to the day they leave. There are six performance domains to be aware of: the physical, emotional, spiritual, social, intellectual and the familial. We have created a website called strongproudready.ca. It’s on the Internet because we want everyone to have access to it, not just those who are in the defence-wide area network. If you go on the website right now, you’ll see all of the programs that could support you if you need help in your respective domains. I’ve always said that it’s the responsibility of leaders to have these programs operational and circulated. If we are able to do this, half of the battle will be over. We will be able to steer our people to the right places. EdeC: So the resources are there, you just need to implement them? Hainse: Yes, they are there 100 per cent. There are a lot more resources than people think. It’s just a question of how we communicate them to the people. And how we educate the chain of command. It’s not just the senior commander; it is the master corporal, it is the sergeant, master warrant officer; it’s all those guys that need to have the tools. They are the ones that have to deal with the soldiers face to face. EdeC: In what areas do you think your contributions have made a progressive impact? In what ways do you plan on developing these areas further? Hainse: Well, I like to think I have made progress in many areas, otherwise I would not feel good about my commitment here. And I do feel good about it. In training, I have made an impact. We cannot go back to where we were, but we needed to refocus on foundational training. I think that area was important to review. Why put a lot of effort into this? The perfection of basic training is what makes a soldier a professional. Once you know the most basic skills, you can be deployed and you can protect yourself, your colleagues, and the people who you were sent to support. This is a relevant concept regardless whether you are a reservist or a regular force soldier. Over the course of three years, I have witnessed the successful training of a generation of young leaders who emphasize the focus on foundational training, which is great. The other area I have made progress in is the alignment of the Army narrative with the future conflicts to which we may have to adapt. So what was the Army in 2014, 2015, and 2016? What has been provided while I have been commander? What is the manpower that is being used these days? Why do we need to train at the level that we are training? I think now we have developed a relevant narrative on these questions. I do realize that the Army is not involved much in the media in regards to procurement, but the Army program has successfully delivered a lot of key pieces of equipment. We are not platform centric. We are a soldier-centric organization and we are in need of pieces of equipment to enable the soldier, which is the most important weapon. Purpose. It is a strategic document that aligns all the force development concepts. This document helps us focus on what we want to achieve. This guidance will allow us to get to where we want to be. was produced in 2007. When I arrived as commander in 2014, it was one of the first things that I looked at. I asked, “Does this still make sense?” We agreed that is was still good. Then we asked ourselves, what do we need to do to keep aligning ourselves with this? I think these documents are helping everybody to stay focused on where we want to go. It will also help guide the next commander moving forward. EdeC: Post Afghanistan, how have you specifically changed training regimens to better reflect the current state of warfare? Hainse: As Commander of the Army, I see my mandate as delivering two things. Maintaining a professional army, and I also need to make sure we provide a combat-ready Army to Canadians. My belief is that you must train every year to a specific level to assure cohesiveness in the forces. For a soldier in the Regular Force, the level that is standard is Level 5. This is where there is a pre-existing understanding of teamwork on a company level. This is the first level where the artillery, engineers, infantry and the armoured contingencies work with each other. Regular Force soldiers need to review these skills on a yearly basis in order to stay competent. The Reserve Force is only committed to this part-time. We should not lose sight of this. Thirty-seven and a half days of training a year is what we ask of them. So what level do we expect reservists to be on? For them I expect them to hone their basic soldier skills plus meet the requirement of a Level 2 or Level 3 state of readiness. This keeps them comfortable working within a platoon. And at Level 2 and 3, they will be live firing on a yearly basis. If they do this then they will be able to ramp up with their Regular Force counterparts with only a bit of time necessary to close that gap. Reservists train to the same standards as soldiers in the Regular Force, they just don’t train to the same breadth. If we understand what piece they are missing, we can easily fill it in when needed. We closed that gap easily during the Afghanistan and Bosnia missions. But I think at one point we assumed qualities of the reservists that are only available in Regular Force members. That’s one thing that is being changed. The other thing is having a combat-ready Army at all times. Today we employ a lot of staff — we employ the air force and we employ the navy. One might ask, “Why do we need an army at all?” Today’s conflicts are about politics and people, and if you want to make a real difference, you have to be exactly where the conflict is. The land element is still something that is key and we need to be able to project that ability. Once you achieve brigade level, this is where you can actually assume leadership. You need to be professional at synchronizing and delivering a lethal or non-lethal effect on the battlefield or operation. If we are able to do it at brigade level then we will be able to do it at a lower level. Right now, one out of our three brigades is maintained at high-readiness level, that is combat-ready at any one time. We follow a 36-month cycle. It is called the Managed Readiness Plan, which I did not change during my tenure. But to give you an example, when we were in Afghanistan, the cycle was 18 months; so every six months we had a brigade getting ready. Do we need to do this now? Not yet. Should we get more involved in operations in the future, clearly that would call for the cycle to be revised. We might have to go down to a 24-month cycle. I don’t know what the future holds. This is the cycle that will ensure that we have the combat-ready capability that I talk about. Your favourite place to eat in Ottawa? Baton Rouge. Subject in school you struggled with the most? Software development — it’s not for me. Your favourite weapon to fire on the range and why? HMG .50 calibre, because it has power. It destroys. If you had to share an apartment with a celebrity, who would it be? You know, this is a bit of a tricky question. If I had to choose a male roommate, George Clooney or Brad Pitt. For female, as a friend, Sandra Bullock. If you could relocate this office to anywhere in the world, where would it be? You know what, after three years, there is no other place I would rather be. Right here. I would not relocate. If I was not here, I would not be able to do my job properly. How do you like your eggs? Over-easy. Are you a morning or a night person? Morning. What is your spirit animal? I would have to say beaver as that represents my regiment. But that’s not what came to mind first though. What came to my mind first was a deer. Why deer? The deer has spirit. When I see a deer running I feel free, there is something spiritual, creative about it.